Did you know that in Australia feral cats cover 99.8% of Australia with a density of one cat for every four square kilometres? While the overall number of wild cats in Australia is unknown, it’s estimated that there are as many as eight million prowling our land. To put this into perspective, one feral cat can kill anywhere between three to 20 animals per week, with their prey ranging in size from crickets and lizards to small mammals. Each year, that equates to close to 1,000 animals being killed by just one cat, making wild cats more dangerous to our native species than any other predator. But where did they come from and why are they such a big threat to our natural ecosystem? Where did Wild Cats Originate? Wild cats first arrived in Australia on the first European settlers’ ships and quickly spread across the continent. The number of wild cats across the country also increased tenfold when they were released into the wild during the nineteenth century in an attempt to control the increasing number of mice and rabbits. It has been rumoured that cats arrived in Australia long before the First Fleet; however, recent studies have found that to be untrue. What’s the Difference Between a Feral Cat and a Domestic Cat? Feral cats and domestic cats are all part of the same species, however, unlike their domestic counterparts, feral cats have been born and have lived their entire lives in the wild. However, feral cats also differ from stray cats in the sense that stray cats are domestic cats that have either been abandoned or have gotten lost. Because they have to survive in the wild, feral cats are generally more vicious than any domestic cat. This is because they have to hunt and kill their prey to survive, and because they don’t have any kind of innate relationship with humans, so they will often view humans as a threat. This is why if you see one they might hiss at you, swipe their paws and hunch their backs or run away. Do Feral Cats Really Pose a Threat? 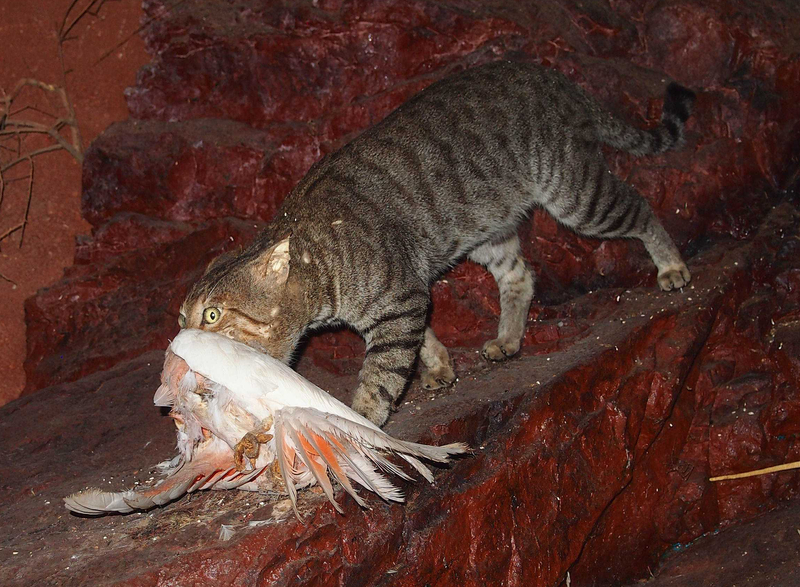 Yes, feral cats pose a huge threat to native Australian wildlife. It’s believed that feral cats are responsible for the extinction of 20 native wildlife species and threaten the survival of more than 100 other native species in Australia. Wild cats are a major cause of the significant population decline among a number of land-based endangered animals, including the bilby, bandicoot, bettong and numbat. Feral cats are also known for carrying a number of infectious diseases that can be transmitted to native animals, domestic livestock and humans. There’s also no reprieve from them, as they can be found all over Australia in all kinds of habitats, including forests, woodlands, grasslands, wetlands and arid areas. As carnivores, they usually eat small mammals, birds, reptiles, amphibians, fish and insects, depending on what is available. 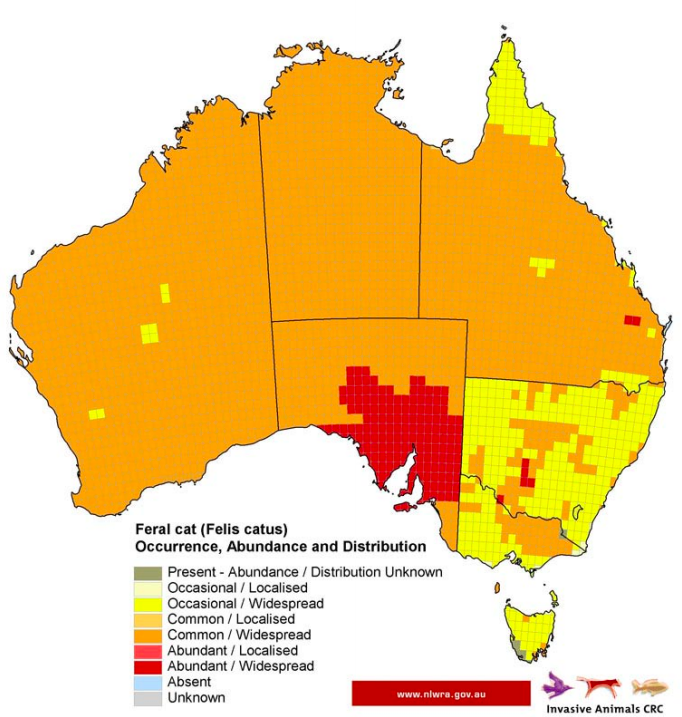 In 2015, a Threat Abatement Plan was put together as a national framework to help guide and coordinate Australia’s response to the impacts of feral cats on biodiversity. It was also around this time that Australian environmental ministers endorsed the National Declaration of Feral Cats as Pests. Control of feral cats is a difficult task. This is because they are notoriously hard to find as they are generally found in low densities over large areas, they’re shy, making them difficult to pin down and they don’t travel over the same route like foxes and wild dogs do. Any poison baits need to be laid on the ground and not buried, like they would be for other feral species, like foxes. Poison baits specifically for feral cats are not available for general use and their effectiveness is highly variable. Other feral cat control methods include shooting and trapping. To learn more about the measures being taken to control the spread of feral cats in Australia, contact the team at Animal Pest Management Services today!